Discover the benefits of pineapple juice, how to consume it and above all that natural remedies contain it! The active ingredients of pineapple become valuable for various disorders. Some fruits do not grow easily on our Italian lands, mainly because the climate and weather conditions do not allow it. One of these is the pineapple, an exotic fruit par excellence, which we also find in Italy and on sale in supermarkets. According to the laws of nature, every man should consume the food that the earth in which he lives offers it because that is precisely what is necessary for him to keep himself healthy. The climate in which we live and the soil also structures our body. When we go to some countries other than ours, the composition of water, the use of different spices or different cooking, lead us to have gastrointestinal disorders. Our body is not used to certain substances. This premise does not apply to a fruit like a pineapple, but it is undoubtedly right to remember that it is not correctly native to our land. That said, alternative medicine and grandmother’s ancient remedies have always used the active ingredients of pineapple for the many benefits they have on the human body. 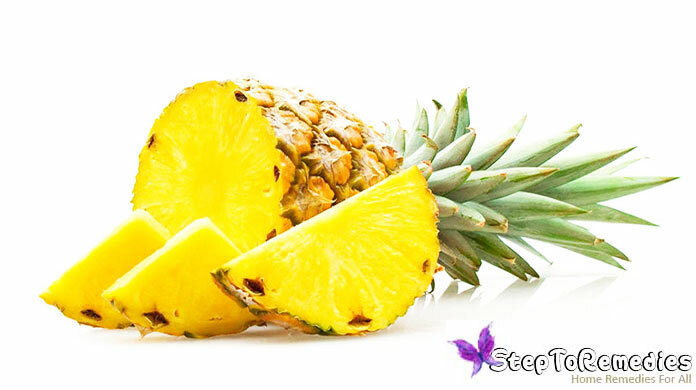 Consuming fresh pineapple has no contraindications and is especially useful for those who follow a low-calorie diet. We know that being an exotic fruit cannot be consumed regularly but alternating with other types of fruit. 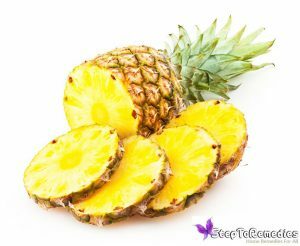 It is within the natural remedies based on pineapple that we get the most benefit from this food. With the extraction of active ingredients, products have created that act in a targeted manner. There are natural remedies based on pineapples that are very useful for the human body and that contain the active ingredients that we find inside the fruit. It generally used in alternative medicine due to the high content of antioxidants, vitamins and a substance called bromelain. Poor calories, with high water and fiber content. 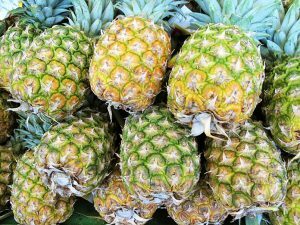 Bromelain, an enzyme contained in pineapple, improves digestion and counteracts intestinal parasites. Why is this enzyme so important? 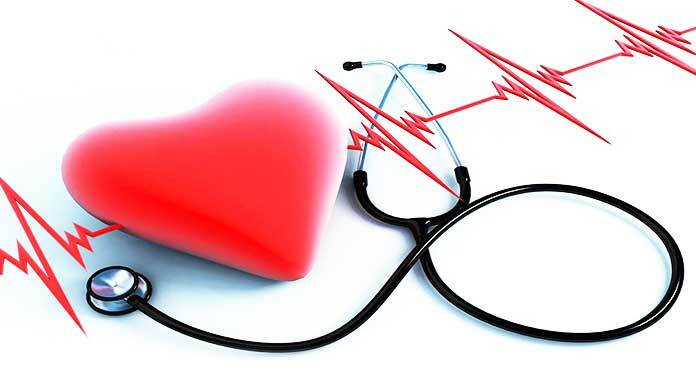 Because it has anti-inflammatory, anti-edematous action, it supports the cardiovascular system. According to some studies carried out on the potential of bromelain, it has emerged that it has a natural anticoagulant effect and that it acts positively on the action of white blood cells which, as we know, work to defend the immune system. Finally, bromelain has antioxidant effects: it slows down and decreases the degeneration of the body’s tissues. Pineapple is a delicious tropical fruit. And the positive thing is that it can be consumed in different ways: fresh, cooked, juice or preserved. If we use only the fruit, its leaves in the Philippines are also used to produce textile fiber. But do you know that it has so many remarkable properties for your health? A portion of 100 grams of raw pineapple is a great source of manganese and vitamin C, and also includes potassium, copper, calcium, magnesium, beta-carotene, thiamine, B6, and folate, as well as soluble and insoluble fiber. The health benefits and medicines of pineapples include their ability to improve respiratory health, treat coughs and colds, improve digestion, help lose weight, strengthen bones, improve oral health, improve eye health, reduce inflammation, prevent cancer, increase heart health, fight infections and parasites, enhance the immune system and increase circulation. To soften and strengthen the nails, you can create a lotion at home using. Mixing them all. It must then be put on nails and cuticles with a cotton ball, for at least an hour. Then rinse your hands with warm water. It is a lotion that can be used every day. If vitamin C is good (discharged), for the skin, vitamin C is also an essential element that helps prevent hair loss. It is the highest antioxidant that fights free radical damage. Pineapple is a rich source of this vitamin. Eat pineapple into wedges or directly drink fresh juice, help to reap the benefits of vitamin C and prevent hair loss by increasing its consistency. Daily consumption of pineapples can help prevent and alleviate inflammatory conditions affecting the scalp, thanks to anti-inflammatory enzymes. Pineapple vitamin C is a valuable aid both “inside” and “outside”. For example, it helps to treat acne and other inflammatory skin conditions. The bromelain contained in it, which is an anti-inflammatory enzyme, increases its power. Plus it helps the synthesis of your body’s collagen. The more significant, the firmer and softer your skin will be. The added nourishment comes from the appearance of amino acids and vitamin C, which ensure the rapid repair of damaged cells and tissues. Apply fresh pineapple juice on the face. Wash with warm water after 10 minutes. Or try freshly crushed pineapple wedges, to exfoliate the skin and make it look healthier: it eliminates dead skin and increases blood flow. You can also try it on cracked corns and heels: it will be an excellent exfoliant. 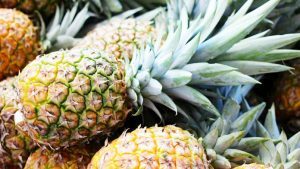 One of the best-known benefits of pineapple on health is its ability to reduce inflammation of the joints and muscles, especially those associated with arthritis, a truly debilitating disease that unfortunately involves millions of people worldwide. Precisely for this reason, those who use daily pineapple has decreased the signs and symptoms of arthritis. That vitamin C helps the immune system, we all know. 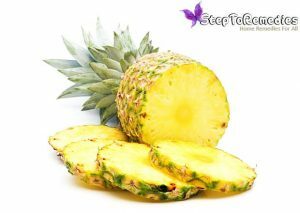 But bromelain also helps to reduce the catarrh and mucus that accumulate in the respiratory tract and the nose. Eating pineapples when we have these symptoms helps and supports specific medicines. Like most fruits, pineapple is a rich source of fiber. 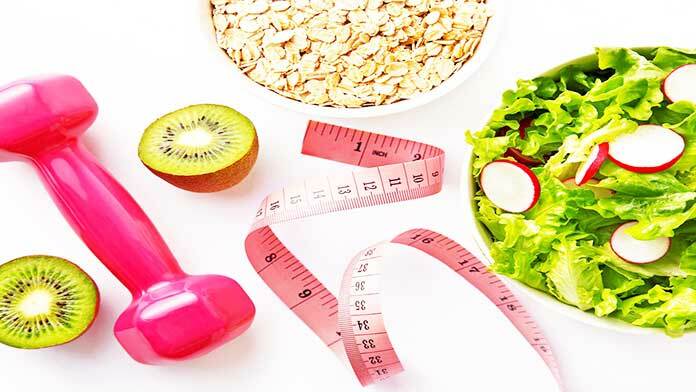 More specifically soluble and insoluble fibers. It means that eating a right amount of pineapple is a great process to help the digestive system: constipation, diarrhea, colitis, atherosclerosis, blood coagulation, and unstable pressure, are all disorders in which this fruit can support. 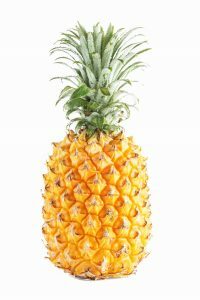 Along with the antioxidant compounds that protect against oral cancer, pineapple also has astringent properties, which strengthen the gums and teeth. Macular degeneration is a situation in which adults lose their sight. Beta-carotene in pineapple can help improve vision and maintain it at a higher level. Bromelain has a strong diuretic power, and this makes pineapple a valuable ally against cellulite. And this enzyme has anti-inflammatory, anti-edema, and anti-coagulant properties: it facilitates the fluidification of blood and reduces localized inflammation. Pineapple, therefore, is a fruit very indicated in low-calorie diets.